Bhanu Saptami is celebrated in the months of Margashirsha, Kartika, Jyeshtha, Phalguna, and Magha during the Shukla Paksha. The sacred day is dedicated to the Sun God (Lord Surya). It is observed on every Saptami (7th day of waxing lunar moon) which falls on a Sunday. The day is also popular as the Vyavasvathma Saptami or Surya Saptami. The greatest significance of Bhanu Saptami is that on this day people who worship Lord Surya are bestowed with wealth, longevity and good health. As per the Hindu Mythology, it is believed that observing a fast on Bhanu Saptami blesses one with sound health and keep all kinds of illnesses and diseases away. Why do we celebrate Bhanu Saptami? Bhanu Saptami holds immense significance in Hindu religion. It is believed that on the eve of Bhanu Saptami, Surya Devta made his very first appearance on the chariot of seven horses. Among various other Saptami tithis, Bhanu Saptami holds great auspiciousness and is widely celebrated in the regions of Western India and Southern India. On the auspicious day of Bhanu Saptami, the observers or the devotees worship Lord Sun by performing Maha-Abhishek along with chanting several sacred Surya Stotras and Aditya Hridayam Stotras to please Sun God. The devotees also make donations of fruits, clothes, etc to the poor. This Saptami is also widely known as Surya Saptami. What is the significance of Bhanu Saptami? Bhanu Saptami signifies the day when the Lord Surya or the Surya Devta ascended on the Earth on his chariot. The arrival of Lord Surya brought life on the Earth. Lord Surya is seated in a golden chariot on a sacred lotus. 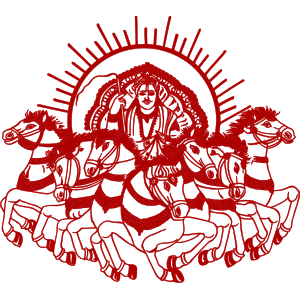 The seven horses draw the chariot and these horses denote the seven rays of the Sun. Aruna is the charioteer of Lord Sun, the one who stands in front to save and shield the Earth from the scorching heat of the Sun. God Sun is the creator of all beings and also the Lord of vitality and health. The individuals who worship Lord Sun and observe a fast of Bhanu Saptami are blessed with sound health and good fortune. What are the rituals of Bhanu Saptami? There are several rituals and celebrations that are associated with Bhanu Saptami festival. Before sunrise, the devotees take a bath, if possible in a holy river and then worship the Lord Surya. Women draw beautiful and colorful rangolis in front of their houses to welcome the auspicious rays of the Sun. The rangoli is made in front of the entrance door and in the middle of the rangoli, cow dung is burnt. In an earthen pot, milk is boiled and is kept facing towards the Sun. As per the Hindu beliefs, it is believed that when the milk is boiling it reaches the Sun. After this, a special dessert, Kheer, is prepared which is made up of twelve heaps of grains and wheat. The same is offered to the Surya Devta in the form of a Prasad. The same is then donated to the Brahmins as it is believed to be a fruitful act. What is the Puja Vidhi of Bhanu Saptami? The devotees need to wake up early in the morning and take a holy dip in the sacred Ganges or in any other holy river. If taking bath in the holy river is not possible, then the devotees can chant the Mantras of Goddess Ganga and invoke her blessings in the water used for taking bath. During the bath, few leaves of Ixora Calotropis (Akka) and turmeric rice are placed on the head on which the water is then poured. Afterward, the observers place a Surya Yantra at the altar and then later a holy bath is performed after the sunrise. After that, Prasad, flowers, and water are offered to the Lord Surya. What are the fasting rules of Bhanu Saptami? Bhanu Saptami fast commences early in the morning and is observed for the entire day. The fast is concluded after sunset. The observers abstain themselves from drinking water and consuming food. The devotees can have water, milk, and fruits in the milder form of fasting. What are the benefits of Bhanu Saptami Vrat? The devotees who take a bath in the sacred Ganges on the eve of Bhanu Saptami shall never face poverty in their lives. Women who perform the Bhanu Saptami puja never become widows in their next births.